No, I am not shutting down my blog. Even though I find myself not blogging as much as I would like, I am not saying goodbye. The hellos and goodbyes I am referring to our those from, Quiltcon, My oldest son and insecurities. The last couple of months have been a real whirlwind of emotions full of adventures along the way. Both good and bad. I am going to start in chronological order. Makes sense, right? A picture of the room where the creativelive class was filmed. I am not a quilting expert, so when I look back at these classes, I was really trying to just keep up with both Cheryl and the other 3 students ….. It is shot live, (obviously) what I mean is that it is all unedited, every word spoken is picked up by the mics we are wearing. So I really had to watch my potty mouth! Creativelive sent us the classes for free for participating. I watched some of it, but to be honest, I can barely watch myself (half the time my head is cocked to one side like my neck is broken) , and hearing my voice, with my severe Michigan accent is like fingernails on a chalkboard! I find it humorous, really!! It was an experience! Here’s my tweet. Shooting the 4 classes took 2 days. I got to hang out with some very, very cool younger people… that made me look and feel very old and uncool!! They probably don’t even use the word cool! They fed us well, and the whole place is just so hip! Moving on… This poor pup almost died, during the same week that the Creativelive Classes were filmed. At first we thought that Peek-A-Boo had pneumonia, but when she wasn’t getting any better we took her back to the veterinarian and found out she had a lung lobe torsion! Basically this means that one of her lobes (apparently dogs have like 6-8 lobes) was twisted and was dying off. It caused poison in her system, started to make her sick and eventually she would die. We had that lobe surgically removed, which was super scary because we were told she might not even make it through the surgery. Luckily she did well, recovered nicely and is getting into her normal mischief. Thank God!! I mentioned earlier in January that I was getting my portfolio together to showcase my fabric and surface designs. I did in fact complete this task. It was an ongoing process until the day before I left for Quiltcon. Whew! Blood, sweat and tears went into crafting that book. It is the first of many to come. You know you have fantasized about riding a giant sewing machine! Thank you Stitch Lab! Quiltcon was AH-MAZING! All those that volunteered! Thank you! I was able to steam some quilts, and it was great fun! If you haven’t been… GO! Now that it is going to take place every year, on different sides of the U.S. there isn’t any excuse to not go! 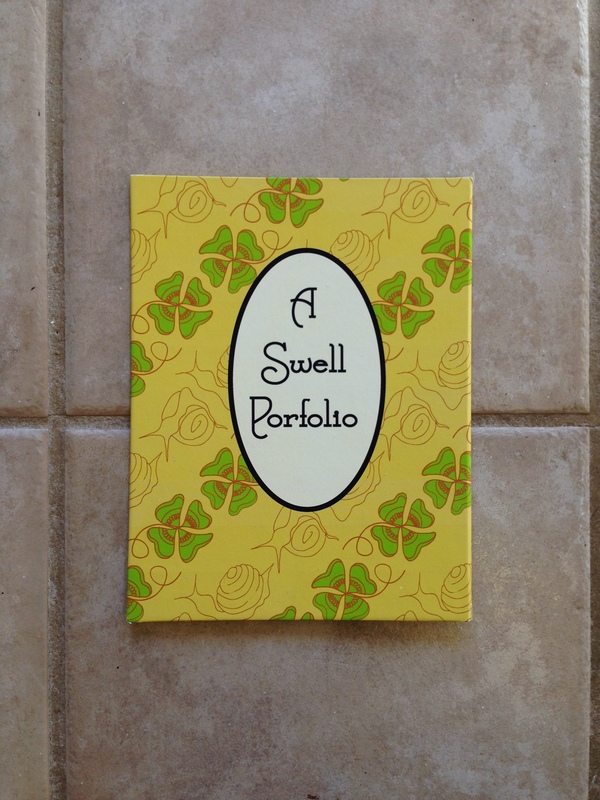 This is my portfolio cover. I used bookboard and an original design for 9″ x 12″ cover. I took my portfolio everywhere I went. I was like Linus with his blanket! I showed it to as many people as I could and I found it to get easier each time I did. I took all advice and insight from those who were willing to offer. 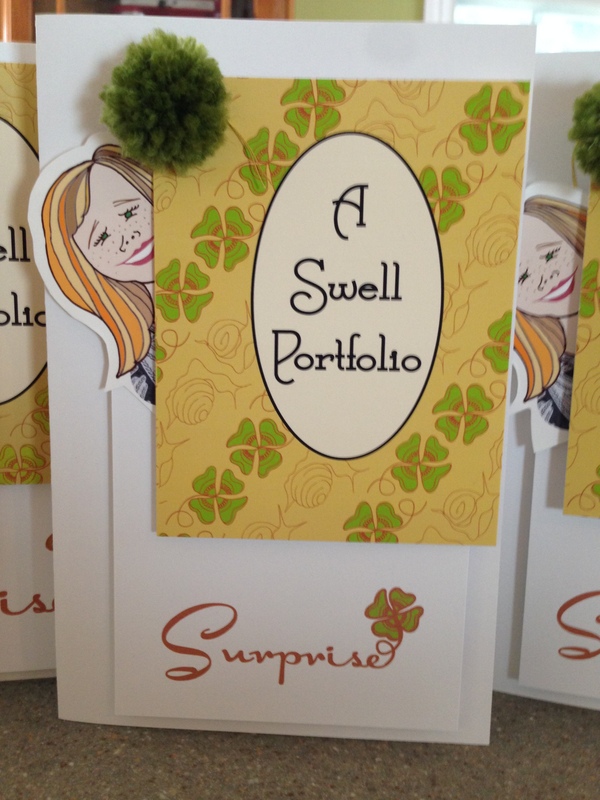 I sent 3 Thank You notes out to some folks that took the time to browse my portfolio. At this time, I have made some pretty nice connections with some top people at top fabric manufacturers. I am not going to name any names, but they are some very good ones! I am always working on new designs, some I’m very excited about, and these will go into my next portfolio! Here are some designs that were included in my first portfolio. ThIs collection is inspired by my upbringing in Michigan. This collection is called Rural Respite and is in the colorway Rapture. This main design is called “In The Weeds”. Unfortunately for me, it became more about my portfolio at Quiltcon, and not about the classes. I did take some great ones, two were with Anna Maria Horner. She is a delight and super knowledgeable. I took the Mod Corsage class she taught. The “Mod Corsage” class which is similar to needle turned applique w/ Anna Maria Horner. It was very fun, and I saw some of my Sew South sisters in that class. I also shared a room with my very good friend Margaret. I met her at the very first workshop I did with Heather Ross! 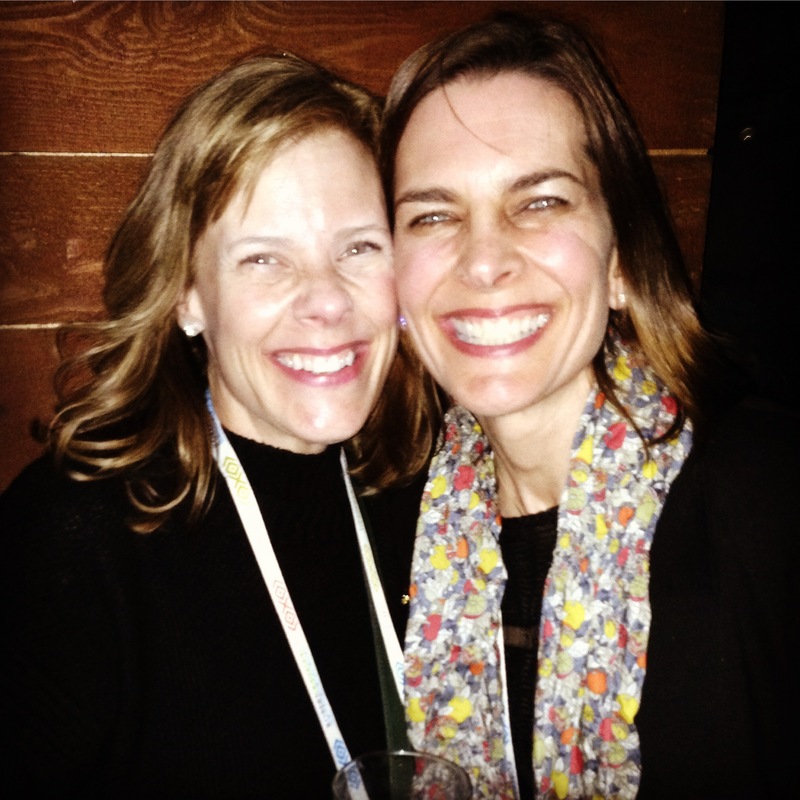 Margaret and I at the Moda Party! Thanks to Heather, I made a really great friend that lives only about 2 hours away from me! Another hello and goodbye was to our oldest son Kenny. He came home from Michigan State University for Spring Break. I am SO grateful he decided to come home and spend time with us, instead of gallivanting off to some crazy unchaperoned teenage bender. So Kenny came home spent some quality time and then off he went again- back to school. That’s me, with Kenny and Will! Saying goodbye at the airport. Again! And now for my last goodbye.. to you! My first finish of the new year! Yay! To top it off it is also a UFO (unfinished object). This UFO has been hanging around my sewing room since May of 2013!!! Wow, I didn’t realize that it had been THAT LONG! I did a Natalie Chanin Workshop, where I purchased a swing skirt kit. I can now say I am the owner of a pretty unique skirt-a completed skirt, that can actually be worn. No longer is that UFO taking up space in my sewing room, staring at me from its plastic bag- mocking me, making me feel as though I haven’t any follow-through. POW! I suddenly feel like a super hero. I am the “FINISHER”… YEAH, YEAH….That’s it! THE FINISHER! I do finish projects. Most of the projects that I finish are those that are for other people. What does that say about me? Do I not value myself enough? I wonder how many of us out there do the exact same thing? Are most of the UFO’s you have in your sewing room projects that are to be finished for yourself? Or are these projects for others? Something for me to ponder anyway. Maybe you should ponder this as well? So as you look through these pictures of my new skirt with its many stitches and threads, maybe you too can think about what you could finish for yourself. This is the year I intend to start tackle some of these personal projects. I think this is a pretty good start. Take some time for yourselves.. Think about what you could do if you weren’t afraid of failing! I am. I am diving in head first and I may fail, but I will never know what could be if I don’t! I have been absent from blogging for about 2 months now. Seems to be an epidemic with me lately. I have been distracted from many things lately. Mostly life. I might be there in body, but the soul? Well…. it’s thinking about other things, and wondering where all the time went. You see, my oldest of 2 children is headed off to college. This is truly something to be celebrated, as there were other paths he could have taken and this by far was the one that all parents hope for. Not only is Kenny going to college, but he is headed to the college that both Jim and I graduated from. A really nice nod for a kid to give his parents. It does make you proud. The one thing that is hard to swallow is that he is 2300 miles away from home. Far away from Marin County, really really far away. Three time zones and a whole other climate away. It’s good though, it’s all good (I say this over and over again while rocking back and forth). Only kidding, I’m not that bad…… yet. I have been known to spontaneously burst out into tears, though. I know there are other moms out there just like me, feeling the same way I do. Right?! I guess you could say I am somewhat in mourning. I call it “mourning” because it is a type of loss. Please, stay with me here and let me explain. I do tend to over-exaggerate. I think anytime your child hits a benchmark, you are both proud and sad. Think of the first day your child goes to Kindergarten, you are so proud, but you are crying, right? Life is changing, he is on his way to his grade school years…. your family dynamic is changing. Right?! It’s exciting- but that little baby that needed you for everything doesn’t need you as much. Well, with Kenny leaving for this new chapter of his life, our family that was once a family of 4 is now 3. I know Kenny is still our child, but the next time he comes home (Christmas Vacation) he will be his own person (he will think he can do whatever he wants under our roof, which is not how it will work), and it will be very different for us to parent him. Fast forward to a few weeks later. Kenny was dropped off to Michigan State University. We (Jim, Will and I) took him there on Sunday the 24th of August. We spent the day moving him into his 12′ x 12′ room, unloading all of his belongings and searching for a futon at any shop nearby that happened to have one left, for any price. The difference between boys and girls, is more pronounced and evident with this experience. In my opinion anyway….. The girls decorate their rooms and make their beds, adding throw pillows that in the end are pretty and inspiring, while the boys (especially my son) throw their beds together and call it a day. I went to great lengths, to make sure that his bedding and hamper matched the huge brown carpet that I spent hours searching for on the internet. Choosing just the right one, that wasn’t feminine at all. I spent weeks, crafting a quilt, a one of a kind quilt, that in the end was tossed up on his bunk like a bunch of dirty laundry. And, although these things came together, and made me feel sad, the hardest moment was that last hug….. the last embrace. My son, now a young man doesn’t need me in the way he used to and was ready to let me go. We spent the last 17 years preparing for this very moment. It’s not like we didn’t see it coming or even that it wasn’t something we fully supported. That’s what good parenting is, I guess. If your kid is able to leave the nest and feel confident, safe and equipped to handle what life throws his way…. then you have done pretty well. He has his “tools” now it’s time for him to “build” something. I free motioned part of the MSU fight song around the border. Here is Kenny’s one of a kind quilt. The quilt pattern (referred to as the water waves quilt) was a pattern that I got from Must Love Quilts. It’s a fast and easy quilt. And for Kenny, it was more on the masculine side. Green and white fabrics were a great choice for Kenny since these are MSU colors. Here, Kenny is telling me to “hurry up and take the picture”. I did a stippling free-motion for the quilting on this quilt. Super fun to do! There is camo binding around the entire quilt. My favorite part. The back with a Spartan, surrounded by MSU fabrics. These are wonky cut 1/2 square triangles. I was going to do the whole quilt out of these, so glad that I didn’t. I had a very hard time finding the licensed MSU fabric on-line. I stocked up when I visited Michigan! I am all set for the next Michigan State University project. So, as for now it has been a week since Kenny started his new adventure, and us, ours. Today has been hard, but like so many mother’s before me, I will get through it and it will all be okay. Perhaps a cupcake would make me feel better. It couldn’t hurt, right? Thanks for stopping by. Until next time, keep creating!